InterContinental is located in one corner of Bugis Junction Shopping Mall. The shopping mall is linked to the hotel by a door. The shopping mall can be very crowded especially weekends, however passing through the door to the hotel, the atmosphere changed from buzzling to tranquility. 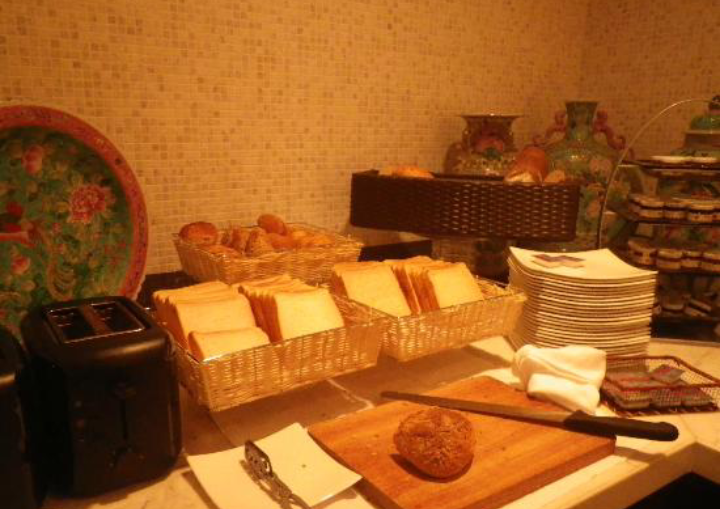 There are no shortage of dining options in and around the hotel. The hotel is also near the subway system in Singapore, providing guests the convenience of moving around in the country. The room we checked in was the Shophouse Suite. Situated in the 2nd and 3rd level of the hotel, it is just above the shopping mall. Despite the close proximity to the busy shopping mall, sound proofing in the room is fantastic. We were not disturbed by any of the noise below the suite. 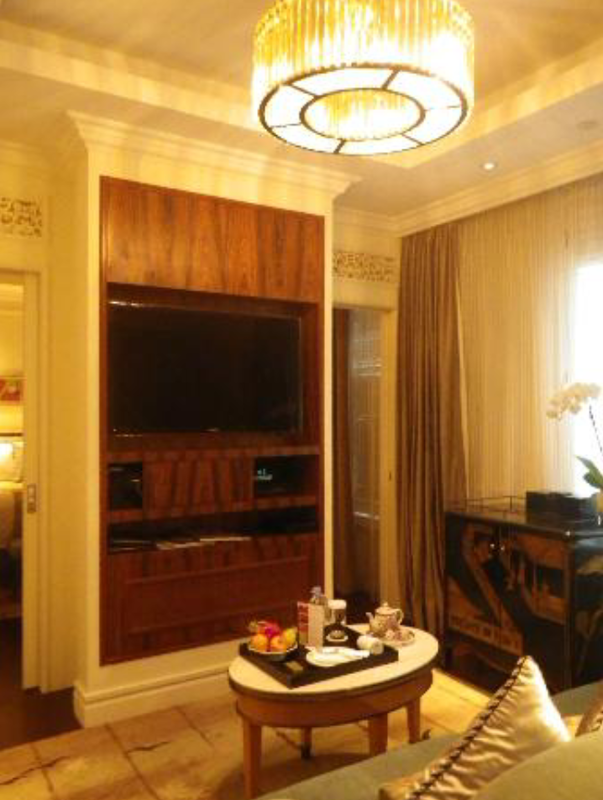 The Suite is rustic yet modern with a touch of Peranakan theme running throughout the suite. The suite has 3 distinct areas to it. 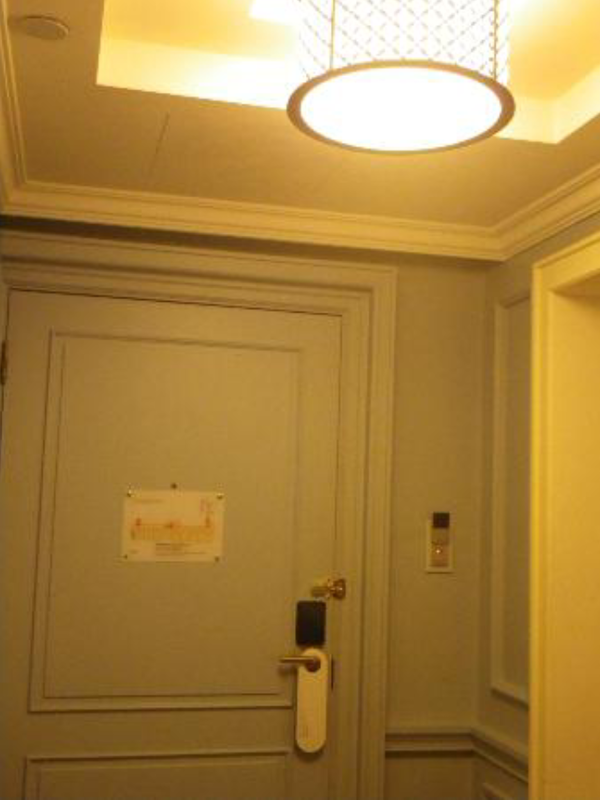 Upon entering the room, a chandelier greeted us at the lobby of the room. There is a mirror opposite the main door and a small wardrobe by the side of the mirror. The storage space in the suite for clothing is rather miserable. The bathroom feels a little cramped. 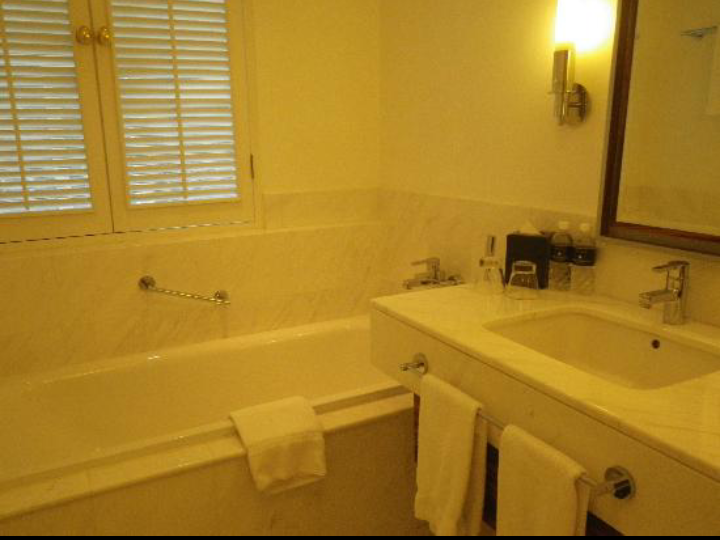 It has the standard Bathtub large enough for one person, placed at the far end of the room, in front of the window that can barely open (there isn’t much of a view from this room anyways). 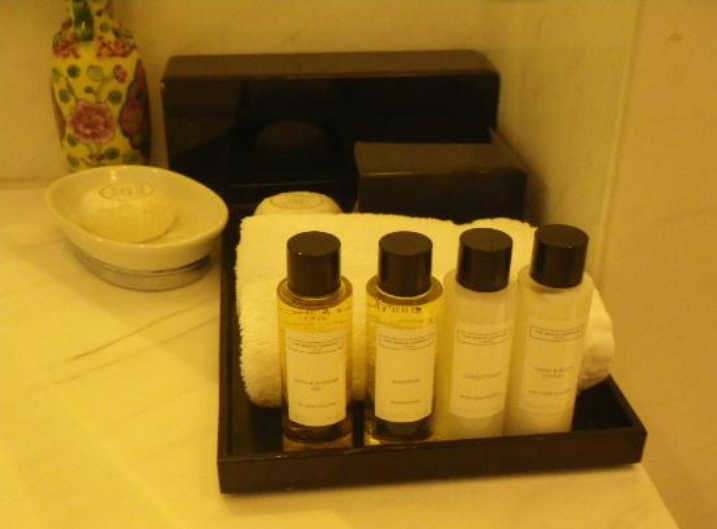 Next to the bathtub is the single sink, where one can also find quality bath amenities from The White Company placed for room guests to use. 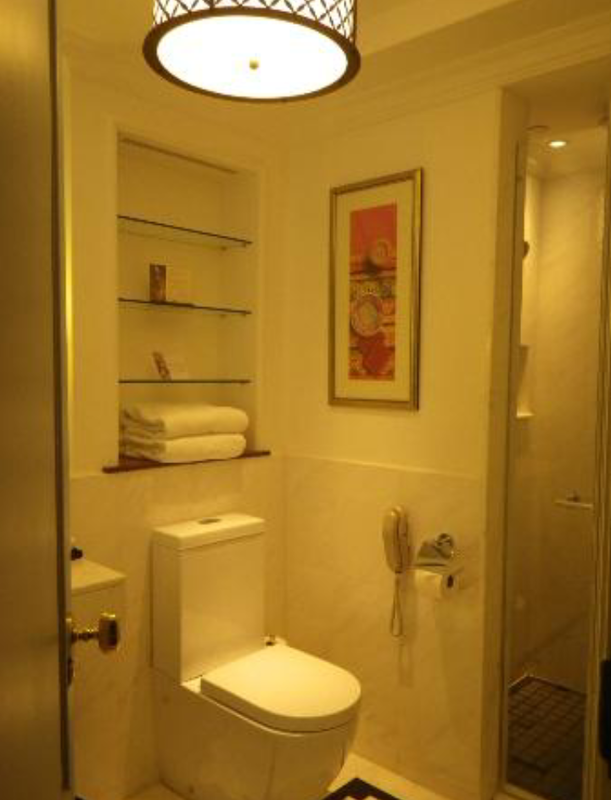 The toilet is placed next to the sink, and the walk-in shower, featuring rain shower, is located at the other end of the bath room. The contemporary bathroom, painted in white with soft yellow light, gives one a relaxing feel. There are hints of Peranakan decors in the bathroom, however these are limited to useless displays of vase and jars on the sink. Further into the suite is where one would enter the living room. There seem to be too much clutter in the living area of the suite with too much furniture in the living area. There is the study table placed next to the entrance of the living area, at one corner of the suite, behind the 3 seater couch. The study table is rather large and has connection points for one to plug in their laptop to the TV via HDMI port. Here is where one can find power point to charge one’s gadgets. The comfortable 3 seater couch is placed right in front of the study table, facing one of the two TVs in the suite. A small coffee table is placed in front of the couch, where I found a plate of welcome fruits. 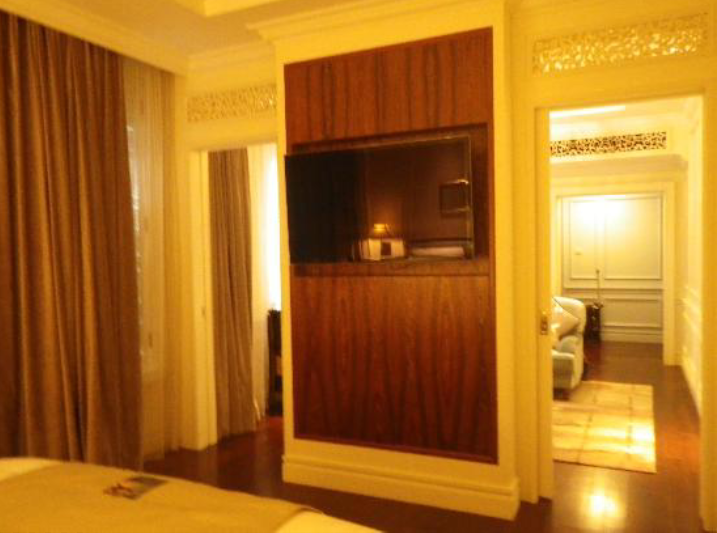 There is a Peranakan themed shelf by the window of the living area, where one can find the mini bar fridge. The shelf looks more ornamental rather then functional. The bedroom is separated from the living room by a wall with 2 doors on either side of the wall. The design of the bedroom of the suite is simple, yet cozy. This area of the room has a King-Sized bed with 2 side tables, where one can find more power points to charge their gadgets. The bed is extremely comfortable to sleep in, with a very comfortable set of quilt. The air conditioning in the bedroom is rather weak. I left the doors open to allow more cool air from the living area into the bedroom for a better night sleep. In front of the bed is the other TV. However there are no HDMI connections to this TV. The HDMI connection found on the study desk connects only to the TV in the living area. To plug into this TV, one would have to pull out the TV and connect directly to rear of the TV. 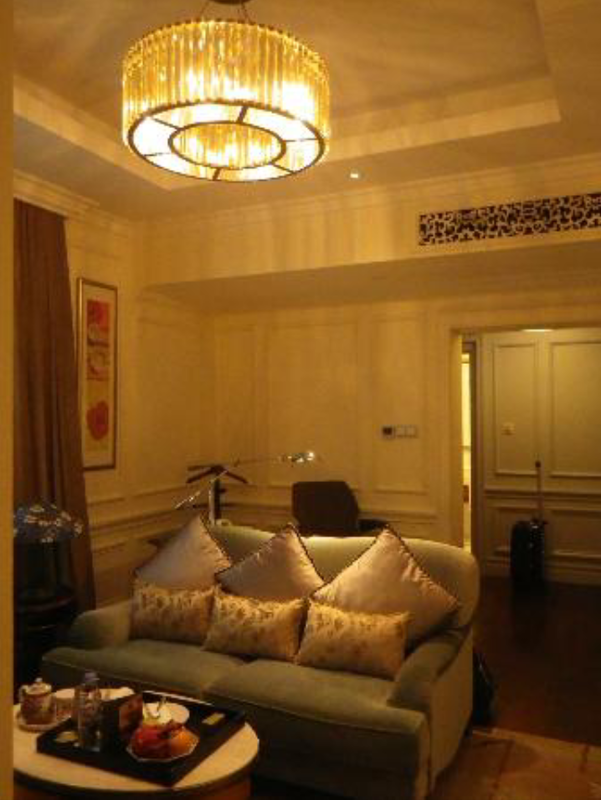 The suite comes with lounge access for guests which admits up to 2 pax. 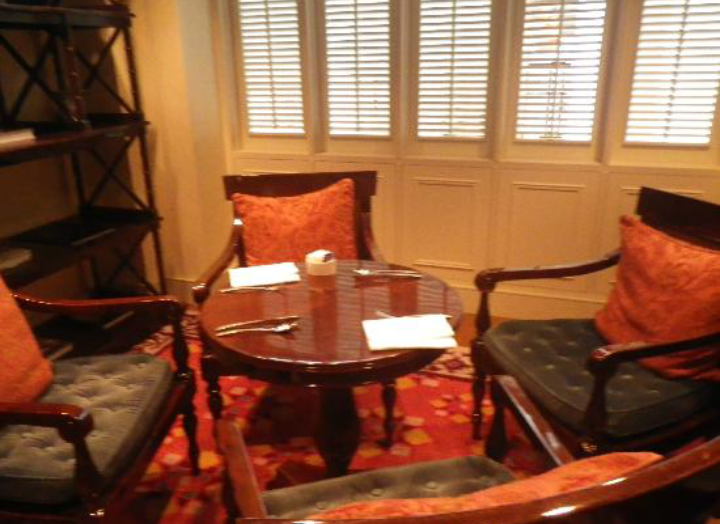 The lounge is where one can find more Peranakan theme shouting throughout the lounge. The lounge is huge and there are sufficient seating for guests. My friend and I hanged out at the lounge most of the time and it is a great place for guests to recharge their energy after a day’s walk around Singapore. There are several timings where finger food is being served. Their afternoon tea time served mostly Peranakan finger food. 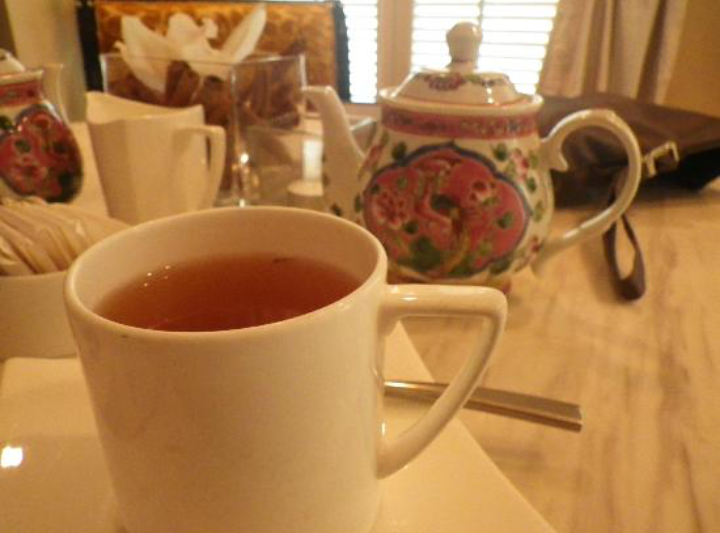 The food is delicious and the lounge served quality drinks such as TWG tea and barista styled coffee. They also served limited food during breakfast, which is a great way to avoid the breakfast crowd at the main restaurant. The service in this hotel is nothing short of 5-star. Their excellent service started with the front desk when I was checking in. The staff immediately put down whatever they were busy with and processed my checking in when they saw me standing at the reception. Another of the staff, upon seeing his colleague was busy, approached to help out without being asked to. Checking-in process was a breeze. When all the necessary paperwork was done, one of the staff (Shawn) escorted me to my room through the maze of confusing corridor. Shawn even pointed out a shortcut, which is an inconspicuous staircase, leading to the club lounge and the shopping mall next to the hotel. Such information is very valuable to guests. The staffs in the club lounge are simply fantastic. They are not only welcoming but also sociable and friendly. There is always a big smile on the faces of the staffs. The staffs are always offering advises on the location, the history of the hotel and when we should pay the lounge a visit for the food. One of the staff even suggested for us to head for the lounge for breakfast to avoid the crowd. On the 2nd, I chose to visit the Olive Tree Restaurant for breakfast and it was full. I went to the lounge for breakfast to avoid the crowd, it felt exclusive and managed to grab breakfast almost instantly. The spread for breakfast, though was not as much as that in the main restaurant, however it has decent amount of selection to fill one’s stomach. I visited the Olive Tree Restaurant the following day for breakfast and had a rude shock on the treatment that was accorded. I approached one of the staff at the entrance to “register” for breakfast, she gave me a shock look as though I am asking for the moon in the sky. She hasted a while before showing us to a table in the lobby. 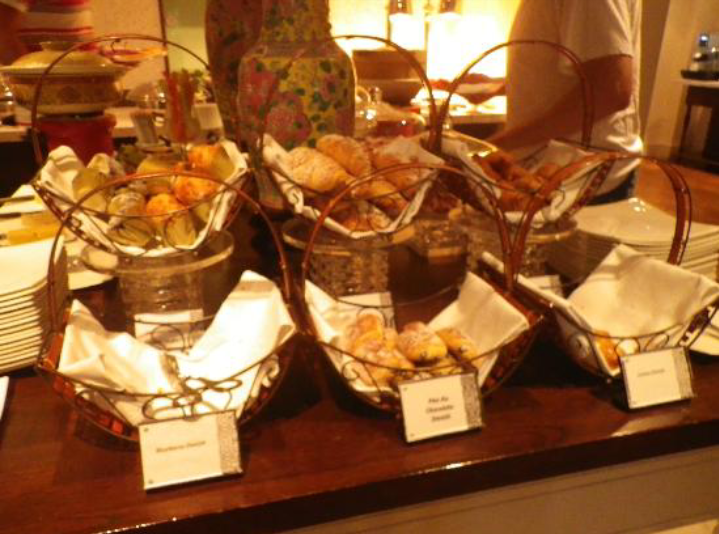 There are some breakfast stations at the lobby lounge and I gotten my breakfast there. The breakfast variety on offer was the same as that in the lounge. I hasten to finish up my food and wanted to retreat to the lounge to avoid the crowd for breakfast. One of the staff came by to clear up the plates and I casually told her that the food here is the same as that in the lounge. The staff was shocked that I wasn’t properly informed that there are more food inside the restaurant. I heeded her recommendation that headed into the restaurant and here is where there are more variety of food on offer. There seem to be a lot of empty table and I questioned why it wasn’t offered to me? As I was walking out to my table after grabbing some food, I saw the staff who gave me a shock look being very friendly to Caucasian guests over their Asian counterparts. That is a level of racism that was being displayed by this staff that is disgusting. I immediately left the place and headed back to my suite to register my observation. Almost immediately after registering my displeasure, I received a call from the restaurant manager – Mr Khoo. Mr Khoo was not defensive and listened to my displeasure. Instead of making up excuses, he kept apologising on the behalf of his staff. Mr Khoo handled the feedback very positively and professionally. As I was heading towards the lounge after my conversation with Mr Khoo, he came up to me and apologised in person, this was not necessary but Mr Khoo took the initiative and the matter in his own hands. As we were about to check out, Mr Khoo some how knew about this, he approached our room, offering a box of chocolate as a gesture of apology and escorted me to the lounge to process my check out. The service recovery displayed by Mr Khoo is excellent and certainly turned a grouchy guest around. On the whole, the hotel gives one a feeling of being treated as a guest. 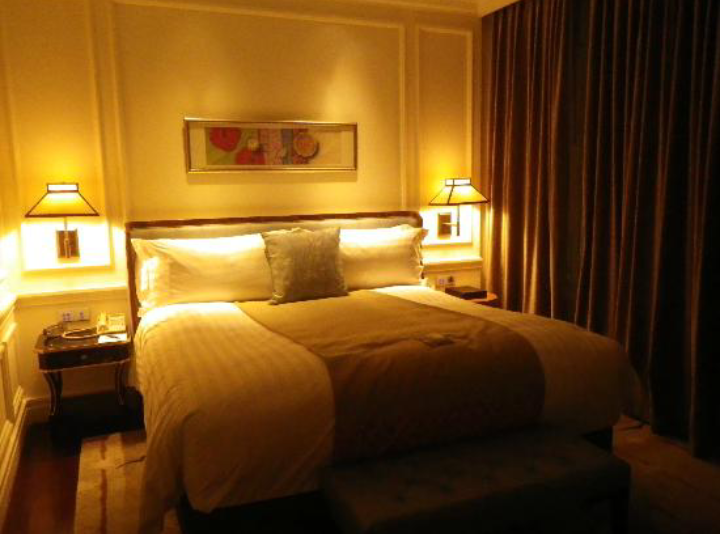 Though the suite is cluttered and felt small, the sleep quality on the bed is excellent. More importantly the staffs in the hotel treated every one, regardless of skin colour as guests. I would love to stay in Hotel InterContinental again as the services rendered is nothing short of 5-star.